NEW Memory Box & Cookies! We are making the best of our new found space. As you know, Dekoko's, the amazing coffee shop at the front of our unit, closed it's doors at the end of March. We are temporarily "spreading out" to fill the void and to serve you better. Have a look at the space now! The girls and I have been working hard to make the unit as cozy as possible. Look at this cute little unit. 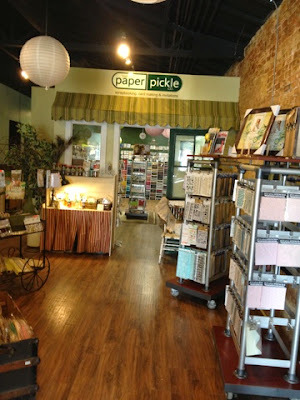 Find the amazing Pickle Station brand pickles here! And check out our adorable Show Topper samples. Ok. Why does this little section of the store make me so happy? Maybe because it is filled with such rustic beauty. Welcome. So glad you stopped by to say hello! Basic Grey, Crate Paper and more! and indoor and outdoor parties! 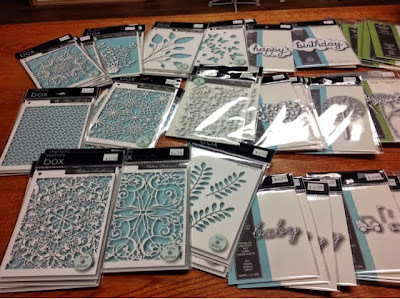 An incredible selection of Memory Box dies and stencils are waiting for you! These are items from their brand new release and I couldn't be more excited. 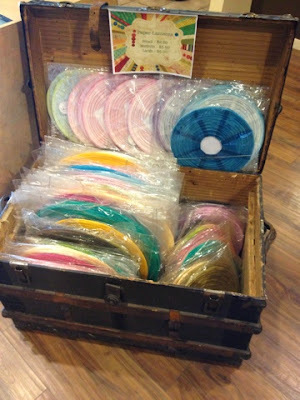 Have a look at these goodies!! We also had another special delivery. 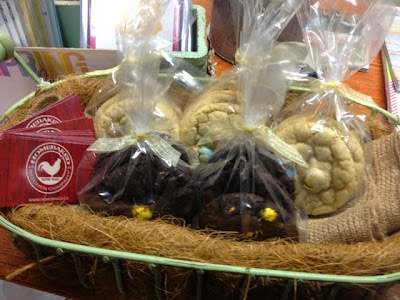 Homebaked Kitchen Company has delivered some yummy cookies for your little bunnies ($5)! 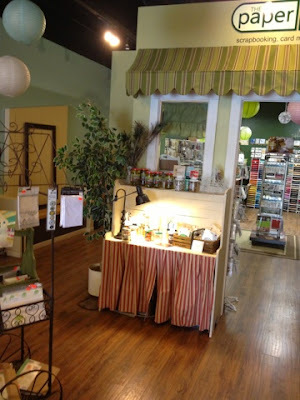 I know I have mentioned this before, but Homebaked Kitchen is my youngest sister Jen's business. I am so proud of her and her creations. Have a look at her NEW website (www.homebaked.ca)! It may take a minute for the page to load as the site is filled with beautiful photos that are sure to make your mouth water! All photography was done by her twin sister, Krystle! I think they make an incredible team. Seriously....my mouth is watering!! Just a quick note to advise you that we will be closed tomorrow for Good Friday. Store will be open on Saturday from 9:30-3. My little gnome says it all...Scrapfest was So (much) FUN! Honestly, if you have never attended Scrapfest before, you MUST! Every April you can count on an extremely well run show in Kitchener and this September, you can expect a phenomenal show in Richmond Hill! Lisa and her dedicated crew know how to host one amazing event with classes, cropping and of course shopping! That's where we came in. Have a look at our booth! 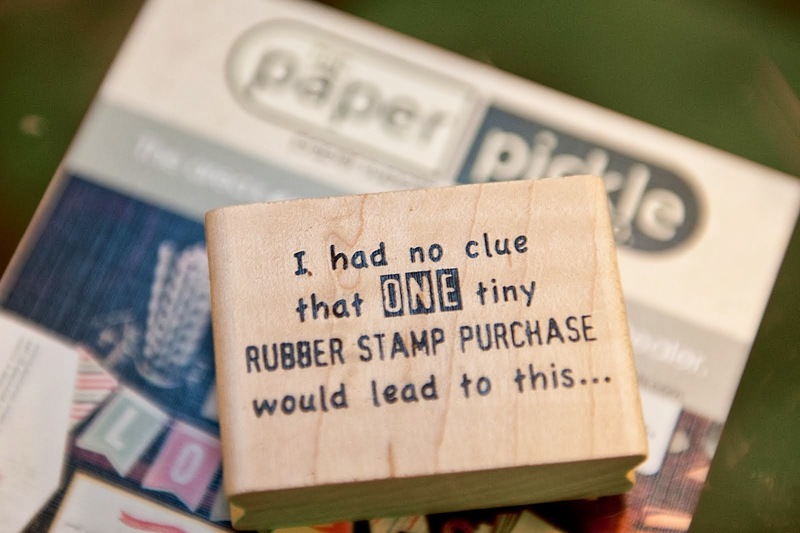 The Paper Pickle LOVES to bring our style where ever we go! 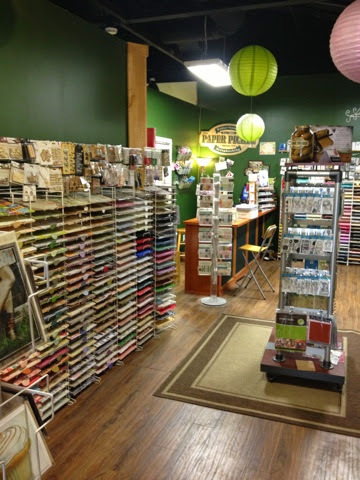 We have never looked like a "typical" scrapbooking store and we never will. 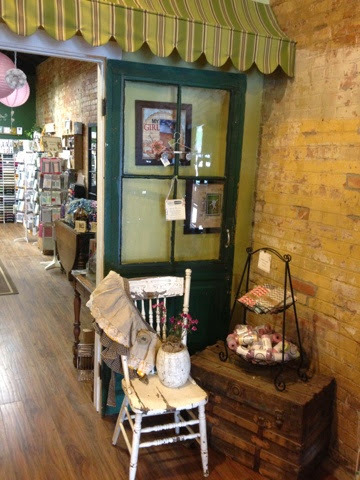 Wire racks are always at a minimum and well loved antiques are in abundance! I will admit that set up could be much easier on my sisters and our backs if I opted for lighter displays! Ha. Krys sampling pickles Friday night! Yes! We HAD The Pickle Station's pickles in the booth! How fitting. We promise to bring more next year! This years booth featured everything that I love! I don't know how else to explain it but one customer said, "I don't know what it is, but everything in your both just makes me happy". Ahhh.....not bigger compliment could have been given! Thank you for "getting" me and and my focus! I have to admit not everyone gets what is going on in this head of mine! This picture is a cool panoramic of the booth. The event takes place in the Kitchener Memorial Complex. We had a great size booth and lots of room to showcase our product and antiques. I loved how our paper lanterns looked in the back drop. Each year we feature a product or products but ribbon is always a constant in our both. Look how beautiful Jen dressed the mannequin with our new ribbon! I SO want to rock that look! The Cosmo Cricket Show Toppers were just one of the products we featured this year. They fit on all wide mouth mason jars and have an adorable little hook on the underside of the lid to hang goodies. Check out these gift ideas! Put a little card in the top holder, add a little twine or ribbon and your favourite goodie and you look like a superstar. People will go nuts and shower you with praise at how creative you are! and an amazing cousin and aunt! You guys are really the best!! We also had a great make and take table on Saturday. Debbie showcased our BRAND NEW paper tapes and dies from Little B. We may in fact be one of the very first stores to carry this line. 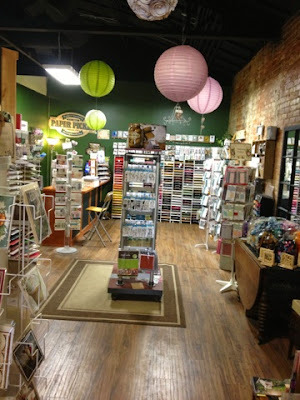 I am so thrilled to introduce you to a company I fell in love with at CHA! 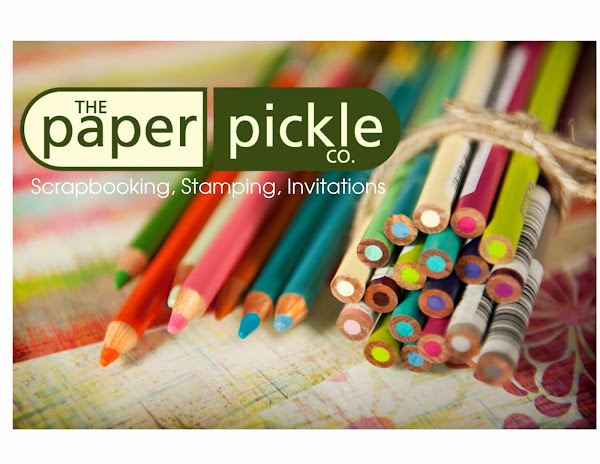 A quick post to let you know about a fabulous card class coming up at The Pickle. 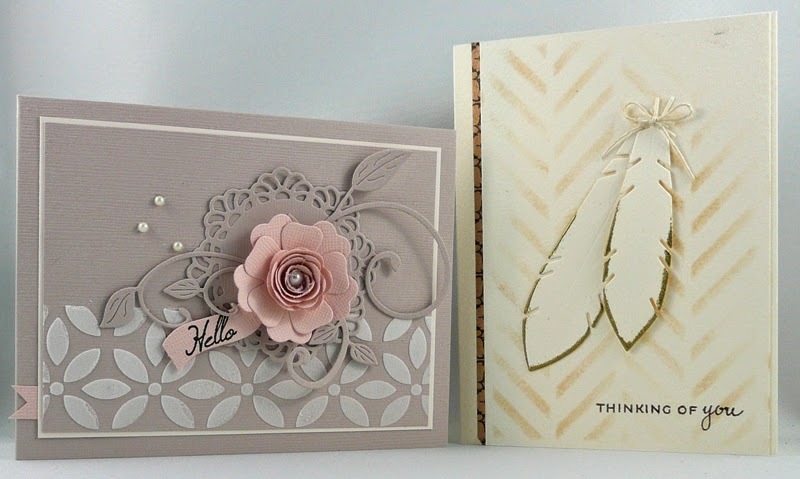 Pauline is back with two beautiful card designs jam packed with technique. Work with stencils, embossing paste, heat embossing, working with various dies, washi tape and more! Space is limited so sign up quickly! I am only accepting reservations via phone (519.351.5220) or in person at the store! NO emails or notes on facebook please! Please ignore the mess in Dekoko's space today. Christy is working to move out large items like freezers and fridges and it is a little messy. This is a big job and we must give her some time to get cleaned up. 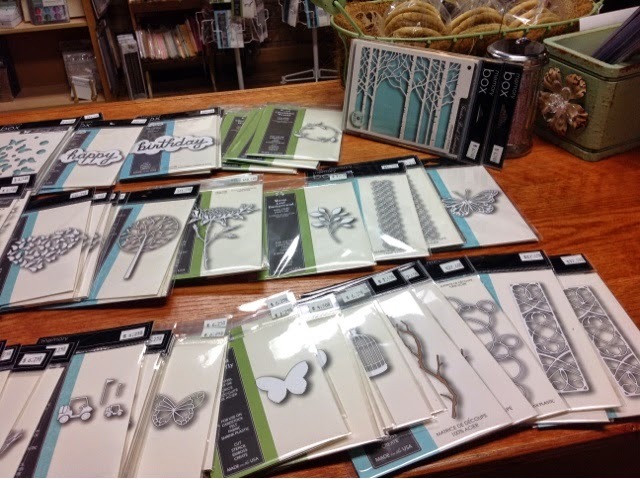 LOTS of new product is in store! It may be time for a little visit if you haven't been in in a while. 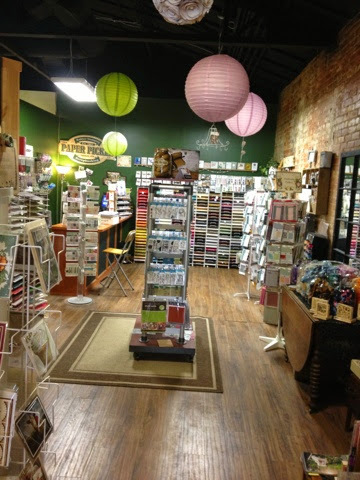 Spellbinder & JustRite items are still 40% off!